Why Do UNI-SOLAR Products Outperform Others? All solar panels are rated in terms of peak power output (watts). Outdoors, under normally higher operating temperatures, solar panel performance changes, depending on temperature, solar spectrum (light color) and related effects. UNI-SOLAR products are less affected by temperature than monocrystalline or polycrystalline solar technology products. UNI-SOLAR portable folding solar battery chargers convert sunlight directly into electricity using UNI-SOLAR Triple Junction Technology. 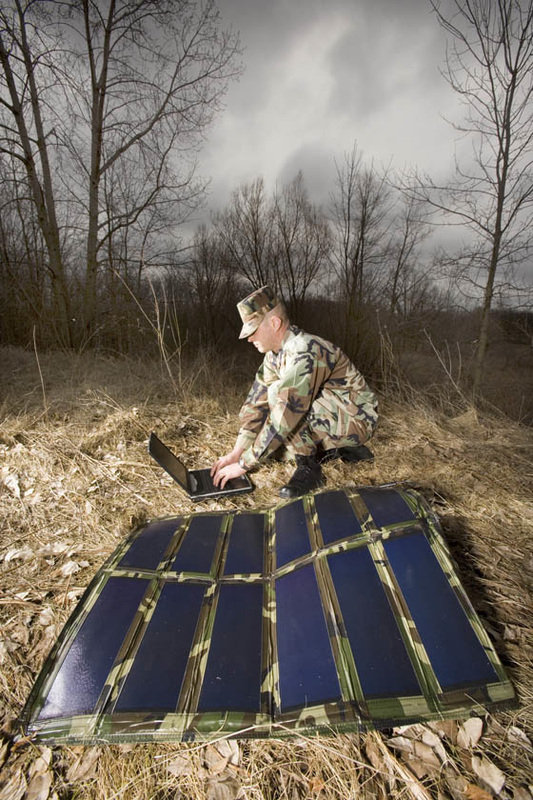 The portable PV-modules are extremely rugged, and their unique design makes them easy to carry and deploy. The UNI-PAC can be dropped, stepped on, packed and re-deployed while continuing to operate. Designed to meet requirements for durability, performance and reliability, the UNI-PAC features a strong, long-lasting front cover made of ETFE. Individual solar laminates within the UNI-PAC modules contain bypass diodes, making the UNI-PAC solar chargers tolerant of severe shadow or partial covering. The tough nylon fabric covering of the UNI-PAC allows the unit to be folded to a convenient book size, for easy storage and transport. The UNI-PAC 15 and UNI-PAC 30 are for 12V charg- ing only. The UNI-PAC 10 can be used for 12 or 24V charging. They have a 2-pin SAE-connector; and a 2 ft. fused battery cable is packed in their pouch. UNI-SOLAR framed modules are mounted on permanent, fixed position module racks that can be adjusted for optimum tilt, wind resistance and exposure to sunlight. These glass-free, light- weight, vandal resistant modules can be utilized in a wide variety of applications from fence charging to telecommunications. The larger framed panels are often used as building blocks in photovoltaic arrays, which can be assembled to meet virtually any load from less than 100 watts to multi-megawatts. The UNI-SOLAR modules are exceptionally durable. They are encapsulated in UV-stabilized polymers and framed with anodized aluminium. The polymer encapsulation includes EVA and the fluoropolymer ETFE. A Galvalume® steel backing plate provides stiffness. Bypass diodes are connected across each cell, allowing the modules to produce power even when partially shaded (exception: US-5). All US-modules have a potted pig tail with integral wiring. The cable is a 2-conductor 18 AWG with insulation rated at 158°F. All other UNI-SOLAR US modules under 30 watts should not be connected in series. *Operating Voltage and Current are typical values when tested under load at AM 1.5 lighting conditions. Power performance may vary due to temperature, light spectrum and other effects (minimum 90% rated when new).